My highly-opinionated takes on Artwork Archive, Art Cloud, Gyst, Artwork Inventory, and Tessera. Recently I researched current art inventory software for artists (not for galleries, those are too expensive and sales-oriented). Judging by the more crowded market and higher prices, entrepreneurs have been paying attention. But none of the products soar. The CALL workbook also suggests tracking contacts, but I’m not sure why you’d need to do it inside your inventory software, and not your native contacts app or Gmail. Second, I’m not interested in turning my art practice into a profit generator, so I don’t need my inventory software to be sales-oriented. I have other software for bookkeeping and making invoices. Third, I’m looking for usability and stability, to insure that my investment of labor and time will not be lost. Depending on one’s practice, it could take 10–40 hours to populate the database with existing works, and then a few hours every month to update it with new works, loans, etc. The software should be stable and operable for at least 5 years, if not 10 or 20, and ideally, 50 to 100. That means the start-up tech companies won’t fold, radically change fee schedules, or stop releasing updates for future operating systems. There’s a lot at stake—choosing this software is essentially betting a longterm stake on a developer’s longevity and commitment. And if it all goes pear-shaped? My fourth criteria is that the software should have clear export functionalities. At minimum, you should be able to easily attain a CSV backup. That’s a common standard, but I still feel a tiny bit more secure with Filemaker-derived software, due to the durability of Filemaker itself. The first decision an artist may want to make is whether you need the software to be based on the cloud, or downloaded onto your computer. On the cloud, assistants can log into your account from any location without having to download the software. But when the software’s on your computer, you can work on it whether or not you have Internet access. Some cloud-based software boasts daily back-ups; downloaded software should be regularly, manually backed-up to an external hard drive or cloud. I’d prefer software that automatically backed itself up. However I found the limitations of the cloud-based software were more significant and inconvenient than the relatively minor convenience of automatic back-ups. Artwork Archive: The first screen upon log-in is the Locations pane. My take: Beauty, not brawns. Too simple. It’s not robust; the number of fields are too limited. 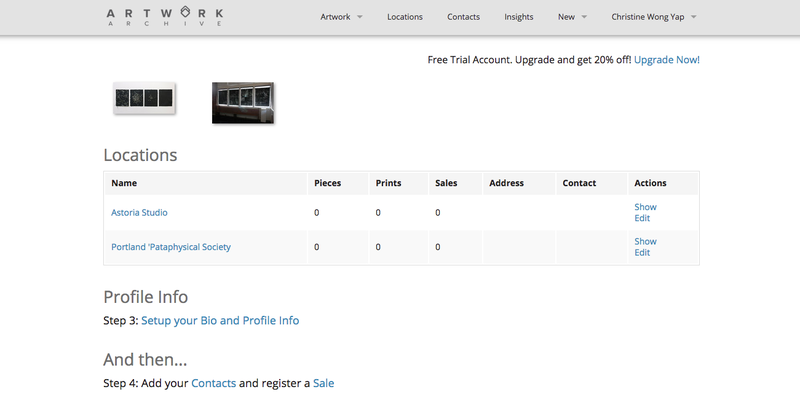 Artwork Archive has a strange organizing principle for their menu: Artwork, Locations, Contacts, and Insights (reports). During my testing, I kept ending up in the Location tab, but I’m only interested in locations as they pertain to artworks—the two are not of equal importance to me. It seems over-enamored with mapping. Lacks a field for exhibition history (part of our first criteria); you have to add a new location for every exhibition, but if you have more than one exhibition at that location (such as your regular gallery), it could get confusing or complicated when you search for the work in an exhibition. You also enter dates as specific dates, but just because the exhibition ends on a certain date, doesn’t mean that the work will be received back right after. Limited edition runs are confusing, because it automatically assumes that the location is your inventory. You can’t change it unless you register a sale. But what if part of the edition is at a gallery on consignment, or at the print shop that made it? What if you donated it, but it may or may not sell? What if it’s in transit? The Reports feature is not very robust. To make one, you download a PDF. You can’t preview it first. You can’t seem to adjust the typography or add headers. You can append which competitions you’ve submitted the work to, but that seems of limited value since nowadays so many calls are hosted on Slideroom or Submittable, where you look up that info. A note about website integration: You can integrate your inventory with a website. I asked to see an example, and it prominently features the Artwork Archive menu bar at the top. Even if I used and recommended software to my friends, I would not want my portfolio to be branded by a product so unsubtly. 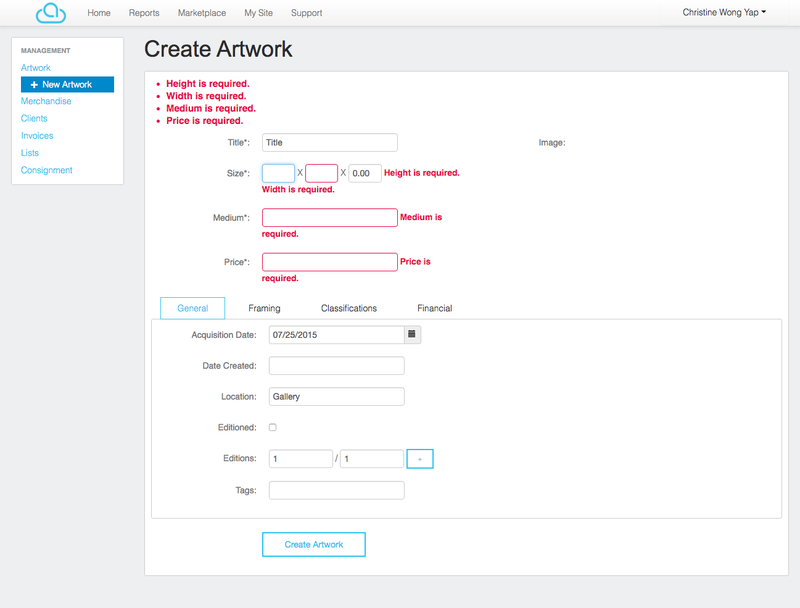 ArtCloud: Multiple required form fields. My take: If you need a cloud-based solution, go with Artwork Archive. Poor, annoying user experience. 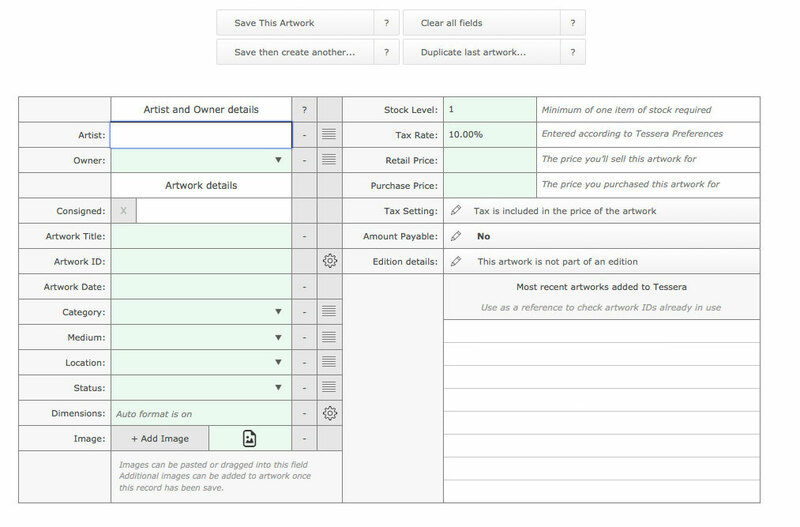 Dimensions, medium, and pricing are all required before you can create an artwork record. That’s not always possible. For example, if you’re having the work fabricated, or you’ve already shipped off the work, you can’t measure it. Further, artists who are represented by galleries don’t set prices. You should be able to create a record with the info you have and fill in blanks later—you shouldn’t be forced to make something up in order to save a new record. These are completely arbitrary limitations. Another example of this is that the inventory number field only allows numbers, no letters, dots or hyphens (the CALL workbook suggests including your initials, and possibly a letter to indicate a category, such as “P” for “painting”). Buggy. I signed in for a trial, and created a new record, got a pop-up that a new record was created, but it’s nowhere to be found. I tried it again, with the same result, with the additional bug that the image field is no longer clickable. No field for exhibition history (part of CALL’s criteria). Gyst: call me a design snob. Note: I reviewed the webpage, but didn’t download a trial. My take: Too many bells and whistles. Aesthetically challenged. The interface looks less goofy than it was years before, but it’s still visually harsh, with white text on solid red backgrounds (which may not be accessible to vision-impaired or color blind users). 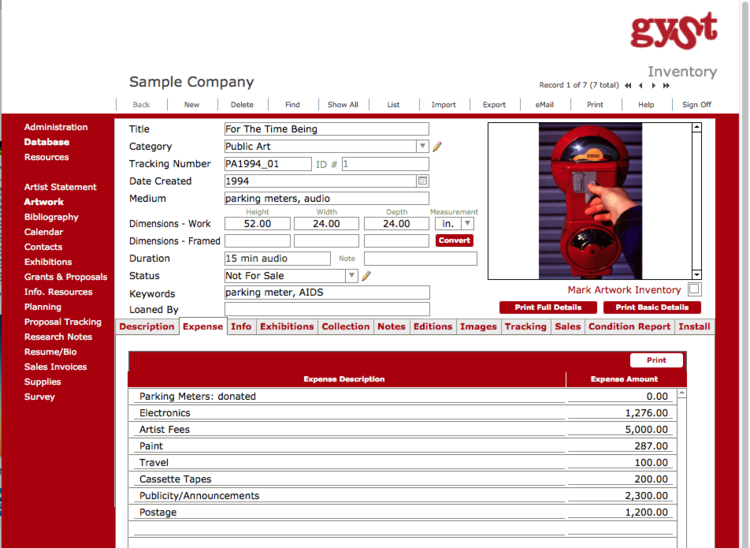 Gyst is still a confusing amalgamation of an inventory system, resources (“Business Issues Advice”), and other functionalities of questionable utility, such as an artist’s statement archive, résumé archive, and bibliography (which text-editing software would be better for; they even suggest importing your grants and proposals from Gyst for “use in a word-processing program to fine-tune, spell check, and format”). Other potentially useful functions are underpowered: in the screen shown above, you can list expenses, but don’t count on basic calculations like multiplying the cost per unit by quantity. My takeaway: A homely contender built with actual artists in mind. This came highly recommended by a gallery owner and artist who used it for years. From the video, it looks like there are a wide variety of reports which artists actually use, such as price lists that are handsome enough to put in a gallery binder. It looks like Filemaker. The interface is small, pinched, and cluttered. A zoom feature would be helpful. It behaves like Filemaker. Knowledge of Filemaker is not common among artists, and the learning curve can be intimidating. In Artwork Inventory, you navigate between buttons on the screen and in the menu bar. Even knowing how to use Filemaker, I found it a bit frustrating to get familiar with all the buttons and they way they are organized. I watched the intro video and browsed the site, but there’s no contact info for support. I’d be nervous that software developed and maintained by a lone individual doesn’t offer any customer service. Maybe there is customer service only to existing customers, or maybe not, but there’s no way to ask first. The risk of the software not being updated for future operating systems feels larger when there’s only one person behind it. You can’t drag images into the image field. That’s a minor detail that will add up when you’ve got dozens of artworks to inventory, or if you want to include multiple views per work. There’s a tab for “website management” where the inventory software might become integrated with a website, which is smart and ideal, but there’s only sales language on it, no examples of actual artist’s websites produced with this integration. One of Tessera’s many windows. My take: The top of a small heap. Caveat: I currently use Flick!, Tessera’s predecessor software, so it was easier for me to pick up its behavior. It’s artwork-centric. It’s robust and customizable. There are lots of fields, including exhibition history. There’s a help desk, and they responded to me. You can export the data to Excel, or various formats. It doesn’t appear to include images, but it’s better than no export function at all. You can drag images into the image field. It’s based on Filemaker and imposes some of Filemaker’s learning curve on new users. Like its predecessor Flick, Tessera is really quirky. You can edit in some views and not others and often end up in odd views, having to find the close button on the pop-up window, or the back button. It’s a lot of mousing that would be better replaced with quick keys like shift-left arrow to go back, or command-w to close windows. The customizability means there’s a lot of setup. Many fields have pull-down menu lists so you can create and select items from value lists. This way, info is presented consistently so records are easier to sort and filter. But that means entering value lists in a new view every time you want to add a new value. A smart way to do this is to enter all the values in your list at the get-go, but few artists who currently lack inventories will have that information organized and available. Oddly, exhibition history does not have a values list, so then you have to re-type or copy/paste the name of each exhibition. This means it’ll be harder to search for everything that was in a particular exhibition, as typos will interfere with results. A major flaw is that you can’t print a view. You can filter and sort results so you can see what you want on the screen, but then you have to take several steps to set up a new printing layout to re-create and print it. Editions work strangely. There aren’t separate records for the editions. They just count them as multiples of the same thing. So then you can’t track which one is sold, who bought it, etc. You can paste in information in the record, but it appears that you can’t attach info, such as an illustrated document detailing installation instructions, condition reports received from institutions, etc. The dimensions don’t automatically convert. The price doesn’t include currency info. None of the other software offer this either, but Flick!, Tessera’s predecessor, did. It’s too bad this feature didn’t carry over. The voiceover on the tutorial video isn’t properly mic’d. The echo makes it difficult to understand. In summary, there’s more products, they’re more expensive, and they’re smarter and better looking. But few developers really understand what artists need, skewing instead towards art-as-business. Those who can offer power and flexibility make sacrifices on aesthetics and usability. Just came across GYST 2.5, software for artists. The package looks really interesting: a combination of databases for tracking contacts and artwork inventory, checklists for different exhibitions/artist’s jobs, goal-setting and to-do list making, and resources — much of the same material covered in the artist’s professional development workshops. This software looks like a good way to get organized. Cheers to the developers! It’s about time. I’m all in favor of artists getting organized. I’d recommend giving it a shot to any artists who haven’t gotten organized, but are self-motivated and organized enough to learn and stick with a new software. (The one thing it doesn’t seem to cover is time management — especially the week or so it’ll take to get up and running on their system). The price — $149 — can seem high for individual artists, but for a software license, it’s not too bad. The designer in me advocates for artists to see that programming is work too, and it’s only fair for software developers to get paid. First, my design sensibilities are too easily offended to overlook the ham-fisted interface. The olive-pumpkin-cranberry color palette reminds me of design projects driven by clients’ favorite colors, rather than the colors that best present the information. The typography isn’t especially screen-friendly or modern. It seems like an attempt to make what’s essentially a management database and digital book friendly and accessible, which seems a bit infantalizing to artists. This interface in particular seems like something that would appear in an Edward Tufte information design book — as an example of what not to do. A grid of hard-outlined buttons (with no clues to organize or distinguish the content) duplicates the list to the right. The only way to find what you’re looking for is to read every menu option, so why bother with the buttons? The round buttons seem especially problematic: white pixelated GIF edges show, and an initial appears where an icon or text should be. “NDFSEB” may be more iconographic, but it’s unintelligible. “New, Delete, Find, Sort, Email, Back” is clearer. I like GYST’s for-artists-by-artists ethos. The only problem is: I wouldn’t expect an interface designer to make great art, so why should GYST expect artists to make great interfaces? Secondly—I have to admit—I might not be GYST’s target user. I have lots of systems in place already: Quickbooks for bookkeeping, a series of folders named with an 8-digit deadline for competitions (YYYYMMDD keeps the closest deadlines sorted on top), an identity system for artwork labels, Address Book for contact management and exporting mailing labels, a goals binder from a previously attended workshop, Excel for budgets (compare Excel to GYST, whose budget is in a list format that lacks basic formulas like Hours x Hourly Rate, or Quantity x Amount). The one component that I’m missing is an artwork inventory program. This software essentially has a Filemaker Pro-derived interface with an image field for a photo of the artwork. That’s a nice feature, but then again, Filemaker Pro is flexible, highly refined, and versatile, so $299 for Filemaker seems not too bad, if it means I can manage my art inventory plus any custom database I’ll need in the future. GYST’s website is vague about cross-application integration. It doesn’t say much about simple set-up tasks like importing contacts from Apple Address Book or Microsoft Entourage, much less exporting to-do items into iCal, a feature offered in Quickbooks. Third, it seems like part of GYST’s features is information. In this way, GYST functions like a resource book. And this is confusing—help sections are useful, but resource texts are a different beast. I think most people don’t read much in a software’s resource section, because the interfaces are not very reader-friendly (I don’t know what GYST’s is like, but being able to expand the window size and text size would go a long way here). And Web and software realms are different than books: in this realm, knowledge should be free, like in a Wiki K-base or Adobe.com’s constantly updated support section; and if the knowledge isn’t going to be free, it should be comprehensive, like how Dreamweaver comes with O’Reilly’s HTML and CSS reference. GYST is in its early stages and I’m looking forward to seeing how it advances, streamlines and improves with a little bit of constructive criticism.